1823	Baron Jöns Jacob Berzelius discovers silicon (Si), which today is the basic component of electronics. 1903	Nikola Tesla patents electrical logic circuits called "gates" or "switches". 1947	John Bardeen, Walter Brattain, and William Shockley invent the first transistor at the Bell Laboratories on December 23, 1947. 1956	John Bardeen, Walter Brattain, and William Shockley are awarded the Nobel Prize in physics for their work on the transistor. 1958	The first integrated circuit is first developed by Robert Noyce of Fairchild Semiconductor and Jack Kilby of Texas Instruments. 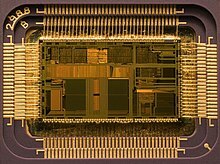 The first IC was demonstrated on September 12, 1958. 1960	IBM develops the first automatic mass-production facility for transistors in New York. ↑ Marshall Brain (2015). "How Microprocessors Work". InfoSpaceLLC. Retrieved 27 May 2015. This page was last changed on 3 March 2019, at 03:00.